You can make it easy for club members to find your favourite Learning Center course by creating a direct link to it and sharing it with them. Here’s how: 1. Log in to the Learning Center. 3. Copy the link that appears and paste it into your email, newsletter, or website. 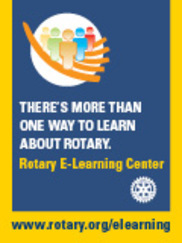 The link takes users to the course only if they’re already signed in to My Rotary, so be sure to remind members to sign in before following the link. Also, remind your members to use only Chrome or Microsoft Edge browsers. Discover all the features of the new Learning Center by taking the Getting Started With the Learning Center course today.